Leaving Nashville I drove to East Lansing, MI home of Michigan State University where I went to college. Every football season three college buddies and I return to attend a game and have a mini-reunion. 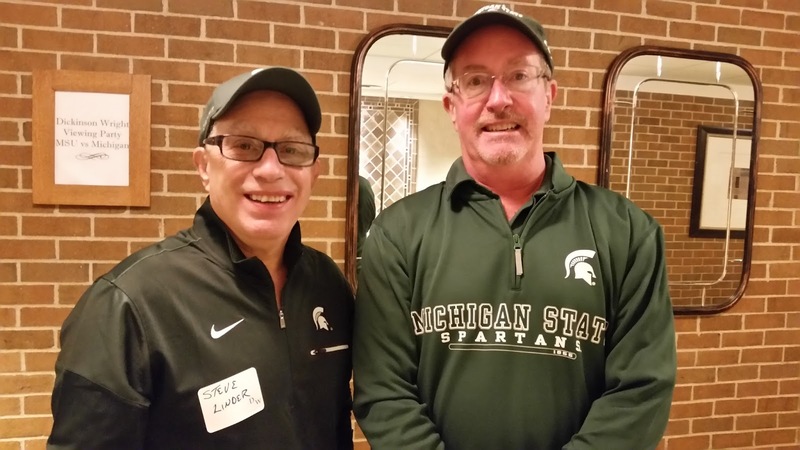 This year one buddy, Gary, was recovering from a heart bypass operation so he couldn't attend. A second buddy, Scott had flown up from Michigan two weeks previously to be around for Gary's operation so he was unable to fly back up so this reunion was my friend Steve and I.
Steve and I attending one of many tailgates prior to the game. We usually try to pick a game that will be meaningful and this year we picked the University of Michigan vs. MSU game although by the time the game rolled around in late October MSU had lost a number of tough games and U of M was undefeated so we went into the stadium somewhat prepared for the worst. Steve has really excellent 50 yard line seats. In the end Michigan State played a very competitive game against our arch-rivals but ended up losing 32-23. Thankfully the weather for the game was mild by late-October Michigan standards and Steve and I had a blast cheering the Spartans on. 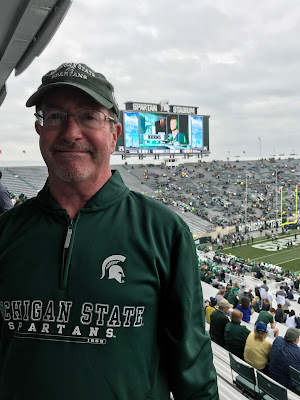 Since Steve had provided me with such a great seat to the game I made a small donation to his Spartan basement at his home where he has tons of memorable Spartan items hanging on the wall. An original Zeke the Wonder Dog promo Frisbee! 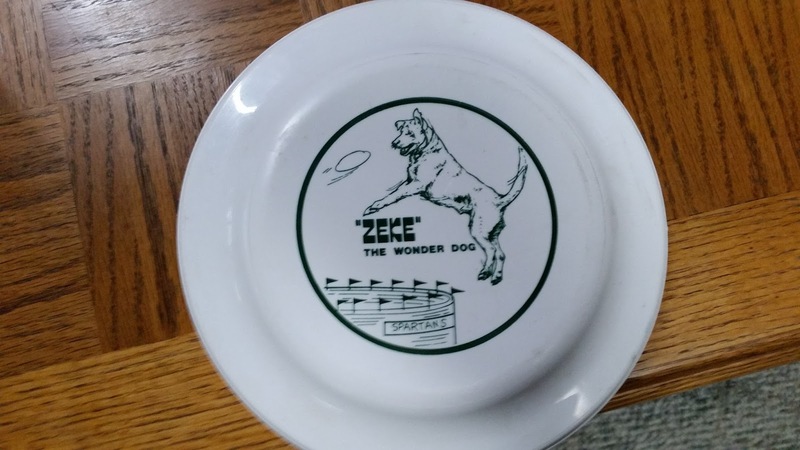 The Frisbee back story: When he was a student in the early 70's (yeah we're that old) Gary owned a blonde lab named Zeke. Zeke loved catching Frisbees Gary would throw him. Gary and Zeke's Frisbee act became somewhat of a fixture on campus and Gary was eventually asked to throw Frisbees to Zeke as a part of the MSU half time shows. Gary and Zeke continued to perform at the half time shows even after Gary (finally) graduated and up to when Zeke got too old and was unable to perform. Gary had a bunch of the promotional Frisbees like the one above I gave Steve but very few remain given the fact that was over 40 years ago. I never used the Frisbee so it's in "mint" condition and I'm sure Steve will find a place of prominence in his MSU basement.